those of you who know how big 17.2 hh in a draught horse is especially when in foal, will know it simply isn’t funny when they slip in the field. Many thanks to Alice my Vet from the George who rushed out to check that nothing disastrous had happened to our beloved mare due to the ice… on 3 legs – luckily it hadn’t ! 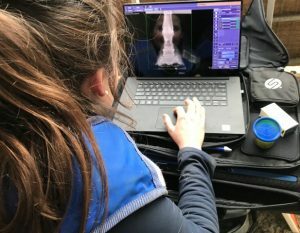 amazing how I have to wait a week for X rays on my leg but I could see it immediately in less than a minute on her laptop with Alice on screen here! what a marvellous Vet Alice is, thank you!